There are currently two vendor pets (in addition to the four Celestial companions) coming in 5.4. The Harmonious Porcupette, is sold by Mistweaver Ku for 7500 Timeless Coins. This is no surprise since we'll be collecting many Timeless Coins in general while on the isle. The other vendor pet requires additional items, currency, and PVP. Not pet PVP. Player PVP. World PVP. Killing your friends and the strangers of the same and opposite faction. Yikes. Speaker Gulan sells the Vengeful Porcupette for 100 Bloody Coins. To earn these coins you'll need to purchase Censer of Eternal Agony from Gulan for 2500 Timeless Coins. After using this item, all players (both horde and alliance) become hostile to you, and killing them will earn you Bloody Coins. Perculia and Olivia Grace confirmed that it's one coin per kill. More details on how this item works here. For PVP servers, this won't really be any different than it currently is, except that there will just be more people to kill/trying to kill you since your faction will also be hostile towards you. It gives people even more reason to gank/kill you heh. For PVE servers, this seems like a nightmare. Players who are normally unaccustomed to being randomly killed or griefed will suddenly feel the full effect of a PVP server. Those trying to kill a rare mob will need to watch their backs for anyone using a Censer of Eternal Agony, since it will now be possible for players to kill anyone fighting the rarespawn, and then essentially swipe the rare from them. This may not be a huge concern, though, since many rare spawns can be tagged by multiple people now. Still, think of how miserable it would be if players were mid-battle with Ordos, and a small group decides it would be funny to go over and disrupt the entire raid. Not for any other reason than "because it's funny". Blizzard doesn't have a strong stance on this, but to me (and many others), it IS griefing. Will this item give people the ability to harass others on a more regular basis? I'm definitely not for this method of obtaining a pet, and I don't know how on earth I'm going to manage this one. I guess I'll have to find some buddies that will allow me to trade kills with. Unless, of course, they implement a mechanic that prevents kill trading. Ugh, I don't even want to imagine it. I'm normally behind Blizzard on most of what they design, but this is just one pet implementation that I can't really get behind. I'll wait and see how it goes once it's released, but the general idea makes me cringe. AWESOME new came from Twitter today. Game designer, Dave Maldonado, Tweeted this image with the text, "It's about time, right?" Damn straight it's about time! XD Even better would be if he does a little dance with his maracas when you emote dance at him. :D Looking at the screenshot, he may do just that! For those that don't know, collectors have been requesting that the Macabre Marionette be turned into a true companion pet for years. Ever since it first appeared as a temporary pet in 2009, I've been pining over this little skeleton, wishing that I could add it to my collection. So the news that we will finally be able to has made me ridiculously happy! I literally jumped up and said "eeeee!" when I read the Tweet lol. We'll have to wait and see when we'll be able to obtain a Macabre Marionette, but Day of the Dead (November 1st - 2nd) is probably our best guess. I just hope that the event won't be buggy, as it has been in previous years. So here's crossing my fingers that everything goes smoothly and I'll finally be a proud owner of a Macabre Marionette this year! The latest PTR build included proper sources for the recently datamined pets. Here's a list of the newest 6 (including screenshots!) plus those that were previously discovered. SO MANY new pet drops from mobs and rare spawns. Yikes. It's getting a little overwhelming at this point. I'm going to have to wait until the PTR build is released and updated before checking out the Pet Journal. Can't wait to see what these pets look like as well as find out where they might come from! 5.4 PTR: Timeless Isle Possible Rare Spawn Pet Drops? Thanks to Wowhead's guide on the new rare spawns on the Timeless Isle, I've amended my original guesses as to which pets will drop from which mobs. I realize that the PTR Pet Journal lists the Bloodcove Droplet as a drop from "Bloodninja McBlood", but there's currently no mob on the isle by that name. It's possible that it may be a drop from an NPC by that title, but it just seemed to fit that a pet like the Bloodcove Droplet would drop from a mob with similar looks. Those are the best fits off the top of my head. Hopefully we'll find out where all the new pets come from soon! Alfonzzo from WarcraftPets dove into the deep end on the PTR and managed to get into the Celestial Tournament. Apparently it IS open for testing, however because the PTR is the PTR and character history is wiped, even if you have many level 25 pre-made pets, the PTR doesn't recognize this and therefore doesn't see you as eligible for the tournament. So in order to enter, Alfonzzo had to re-level 30 pets to max level. Yikes, what an undertaking! Side note: Crithto mentioned on Twitter that they will be lowering the number required to enter the tournament to 15 on the PTR. - The tournament is in an instanced version of the Timeless Isle. - There are multiple stages, with a total of 7 battles you must win. - You can use different pets/teams for each battle. - Sounds as if opponents are NPCs, not actual players. I'm sure we'll hear more about each battle and find out more details about the tournament as the PTR progresses. Hopefully devs will unlock the tournament for those that can't re-level pets to max, so more people can test out the event. If not, then we better start manually leveling those pets on the PTR! Cryptozoic has an informative article on the upcoming TCG, Reign of Fire. They provide some pretty juicy details! "The odds of opening up a Loot Card has also been improved (to 1:9 packs instead of 1:11 pack). That means you will get four Loot Cards per box, and there's a whopping four rare Loot Cards per case!" "The Reign of Fire Epic Collection will also contain one Loot Card, which can range from common to rare. As a note, just because a Loot Card was common, uncommon, or rare in its original release doesn't mean it shares that rarity in Reign of Fire. Some Loot Cards might be easier to obtain than before; others may be a lot harder to acquire." "Some lucky fans may open a booster pack that contains not one, not two, but fifteen Loot Cards – primarily rare Loot cards - instead of the standard cards you expect to open. That isn't an accident. That's a God Pack! God Packs were created internally to be as juiced and as exciting as possible. And they're very rare. If you open up one of these, then congratulations!" So not only will Reign of Fire contain every loot card from previous expansions, the chance of finding a loot card has been increased and they've also added a rare bonus a pack that contains JUST loot cards. Is a loot hoarder's dream or nightmare? lol. Although they've improved our chances of loot slightly, it's still all up to RNG. There's no guarantee that you'll find THE card you're looking for, or even something that's equivalent. That being said, I'm still considering investing in a box. I've never purchased an entire TCG box before, so I might be in over my head here. But the prospect of opening up a pack to find a pet I didn't have before, or one that I could sell/trade to finally buy the last couple that I need... it's very tempting. My luck has never been stellar, though, so I might have to think on this a bit more. Reign of Fire releases July 23, so not much time left to second guess myself lol! The Timeless Isle is up for testing on the PTR, however much of the pet battle-related content is still unavailable. There's a great overview of the isle on Wowhead that you should definitely take a look at. Covers almost all of the need-to-know info. To get to the isle, simply open up your mailbox and open the package sent to you from Watcher Lara. The item inside will teleport you straight to your faction's hub, and you'll be able to pick up the flightpath from there. There's also an inn you can set your hearth to at the main courtyard as well. Even though the pet stuff isn't ready yet, you can preview the four celestial pets that will be fore sale. They're sold by Master Li and each pet costs 3 Celestial Coins. The coins seem to be a reward from the weekly quest (account-wide), The Celestial Tournament. To enter the tournament, the only requirement is that you have 30 max level pets. It's likely Master Li will assist in entering you into the event. So what is the Celestial Tournament? The NPC Oriana gives us some details. "You cannot heal or revive your pets during the tournament. If you run out of pets to use in battle, you can leave and enter the tournament again. If you lose to a challenger, you may fight them again. You cannot attack any challengers in actual combat, even if they belong to the opposing faction." The first portion of the description plus Master Li's prerequisite makes it sound as if you'll have a pool of 30 pets you can pick from during the event. It will probably still be a challenge, even with so many at your disposal, to defeat all opponents without healing or reviving. Depending on how many people you have to defeat, of course. With only 30 pets available to you, you'll start out with a max of 10 teams. Of course you can create even more by mixing and matching, that is... if all your pets survive each fight. Pets that have self or group heals will probably be very useful. The last part of Oriana's description implies that we'll be facing actual players during the tournament, as well as NPCs. If pet PVP is involved, this will be more of a chore than a fun event for me. So I'm pretty anxious to find out just exactly WHO we'll be up against in the tournament. They all cost 500 Timeless Coins each and are currently tradeable (this may change). Right now they are still works in progress and don't actually do anything, but it'll be interesting to see what our pug pets look like when fitted with some neat gear! Some things I'm eager to find out: Are these one-time use items? Will the costumed effect persist through pet swaps and log outs? Will these items remain tradeable? Will everyone see the costume or just the owner/user? If 2000 coins for all four pet-vanity items seems like a lot, don't worry. There are many ways to earn coins all over the island. From killing things to looting random chests/boxes/caches, you'll have enough currency in no time. The part that's actually tough is finding Whizzing. Since he's a rarespawn vendor, he only shows up every now and then and doesn't stick around for very long. According to Perculia on Twitter, Whizzing spawns in various spots on the perimeter of the court. I've seen him show up in two different spots so far. Just keep an eye out for a giant snail and you're all set! As for the rest of the pets that might come from the new zone... Until they add more to the Timeless Isle and finish up some things, we'll just have to keep speculating. There are MANY mobs that match or are similar to the 17 newest datamined pets. Since many of these pets are listed as "Timeless Isle" drops and also have items associated, it's likely that they will be drops from their corresponding creature on the island. There are also various moth critters so they might turn out to be new wild pets for us to capture. All of the mobs listed above haven't dropped any pets for met yet, so they might not be implemented on the loot tables yet. Or they might not be drops at all. We'll have to wait and see! The latest PTR build is up and ready for previewing! We're in luck because the 17 datamined pets were added to the pet journal, despite being unfinished. You'll notice that most of the sources will say "Timeless Isle", but it's safe to assume that that's just placeholder text. I cannot stress enough that much of this should NOT be viewed as the final product. There's even a note on the PTR for each of these pets, "Designer Note: temporary abilities and breeds." We'll very likely see each one updated with proper sources and actual abilities in the future. Lil' Bling is now in the 5.4 PTR pet journal! It's a (likely rare) drop from the Blingtron Gift Package. I better start getting into the habit of talking to a Blingtron on a daily basis! Thankfully, though, Lil' Bling is cageable even if the pet item that teaches him is not. There were 17 new pet summoning spells added to the PTR recently. It's unclear if we'll be able to collect these pets or not. I'm hoping so! There are 3 without items still (indicted with a *), and 14 are currently listed as BoP; it's unknown if they will be cageable. I'm especially curious about Kovi-Wovi and the Gooey Sha-ling. Sha of Gooeyness? XD Can't wait to see where these pets turn up! Not much has been happening on the PTR lately. The Timeless Isle is still not open for testing, so we don't have an idea of how the new Celestial pets will work yet. A new PTR patch was released, and a new pet was added, though. Lil' Bling! The item itself is BoP, but there's no indication how we'll obtain it. One can only assume that it will have a similar (it not identical) model to Blingtron 4000 lol. Unfortunately, Lil' Bling hasn't been added to the Pet Journal on the PTR yet, so there's no official preview. Maybe soon? We'll have to wait and see if we'll even be able to collect this new pet. 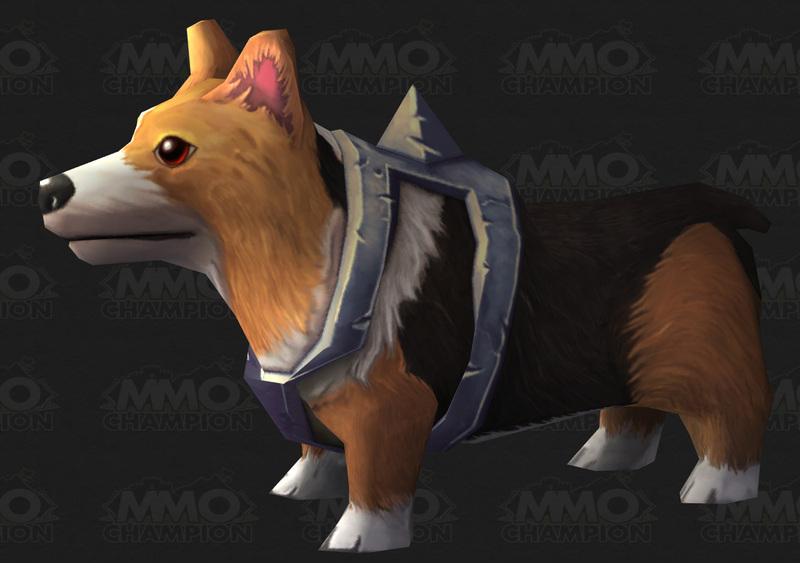 And last but not least, a new model was added to the game, a corgi! No sign if this will be a pet model or something else, but it's exciting to see another puppy in-game (even though I'm a cat person at heart :P).